Bill Abrams is an aeronautics engineer by profession, but he tinkers in his spare time with scientific riddles–like how to produce ethanol efficiently. 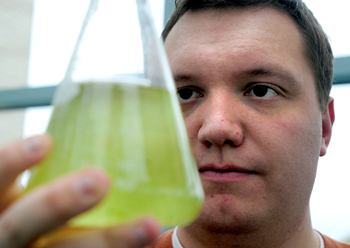 When ethanol gained popularity several years ago as a gasoline additive and, later, a replacement, Bill’s son Jim, then a business student at King’s College in Wilkes-Barre, Pa., took an interest in one of his father’s theories: a robust ethanol-production method that doesn’t threaten the food supply. The idea launched EthosGen, a father-son startup that has sent the pair on a fact-finding junket to Sweden and caught the eye of the Department of Defense. Most fuel-grade ethanol, which is essentially alcohol chemically dried to purity, is currently brewed by fermenting corn. Though easier, corn-ethanol production has been criticized for increasing the price of corn and, subsequently, most food products. 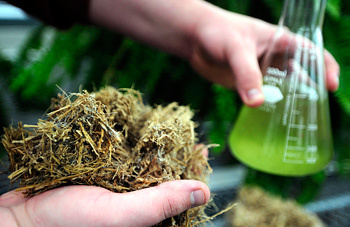 Another method of production, called cellulosic ethanol, is to distill from cellulose sources, which include nearly all plant life. While that method avoids competition with food supplies, it’s more complicated and expensive. Experts believe it’s at least half a decade away from economic feasibility because research hasn’t yet produced cheap enzymes that can break down the various cellulose types. 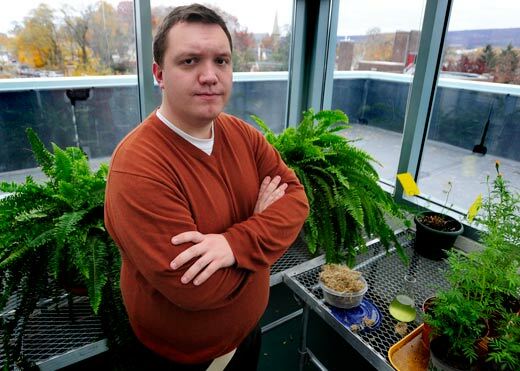 However, Bill Abrams’ idea was to choose a particularly prolific cellulose source–a C-4 grass species–and find a single enzyme that’s particularly effective in breaking it down. Instead of using multiple keys to open every lock, he would choose the lock and find the key that fit best. While his career kept him from pursuing the concept, his son was graduating from college and looking for a business opportunity. With his father’s blessing, Jim took the idea and added his own twist to the business model: franchise it. Because it attracts water, ethanol can be contaminated in pipelines, so it has to be transported by trucks or trains, which adds expense. Jim decided the solution was to eliminate the costly transportation, and produce the fuel where it’s needed. That meant that the production facility would need to be easily replicable and scalable so it could roll out quickly and also fit a range of potentially harsh environments, from mine-scarred lands in Northeastern Pennsylvania, where the Abrams are from, to deserts out west. The potential to eliminate the costly and vulnerable supply chain in hostile areas has piqued the interest of the Department of Defense, which recently granted EthosGen about $1.5 million to construct a working production facility. U.S. Rep. Chris Carney of Susquehanna County, a Navy reservist who believes projects like EthosGen will anchor a “green corridor” of environmental industry in his district and create jobs, guided the grant. But with some funding secured, EthosGen has a while to go before it proves the system. Crops of 13-foot-tall grass plants are growing at a local greenhouse while Jim Abrams and a company of advisors work out of office space at King’s College. Before the facility design can be tested, the product itself must pass vehicle-fuel quality assessments. Still, with the validation of the military grant, EthosGen has taken a major step from interesting idea to profitable business model. The company is working with several universities, including Cornell, to research the process, and the “final piece of puzzle” for the production facility was scheduled for late-October delivery, Jim said. Although EthosGen has come across applications for its unique ethanol process that the company “never in our wildest dreams” would have considered, Jim said it’s developing slowly and they are controlling rapid expansion. While recognizing that alternative fuels have various detractions, some of which might not become apparent until the fuels are in greater production, that doesn’t bother Jim Abrams. The alternative to alternative fuels, as he sees it, is going backwards. Rory Sweeney writes on energy and the environment, but spends much of his time wondering how the baseball gods could lead Philly to salvation and yet leave in exile the disciples of Pittsburgh and Baltimore, for whom there is much wailing and gnashing of teeth. Send feedback here. James Abrams of EthosGen in a rooftop Greenhouse. The dry grass and liquid pulled from it which is used to make ethanol. 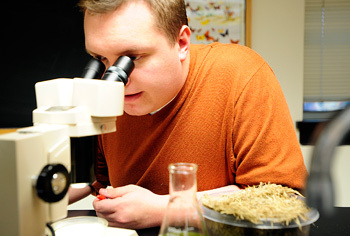 Jim Abrams working in a lab in Kings College. Jim takes a look at liquid result pulled from grass.